South Indian restaurant on South End. 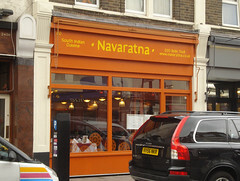 It opened in March 2014 as Bombay 7 photo but rebranded to Navaratna in November 2014. Last edited 2019-03-09 13:17:10 (version 29; diff). List all versions. Page last edited 2019-03-09 13:17:10 (version 29).